Do you get chills when they sound the Gjallarhorn? Do you dress up in Helga hats every football Sunday, even if you're not visiting the stadium but just going down into your man cave to watch your favorite team? If you love the Purple People Eaters, the Minnesota Vikings Pool Table was made by Imperial Billiards just for you. It offers the Viking logo along with the team colors of purple, gold and white, creating the perfect linchpin for a Viking-themed game room, basement or man cave. Imperial has been in the billiard industry since the 1930s; you can rely on them to provide a great playing experience and a long-lasting product (10-year warranty). 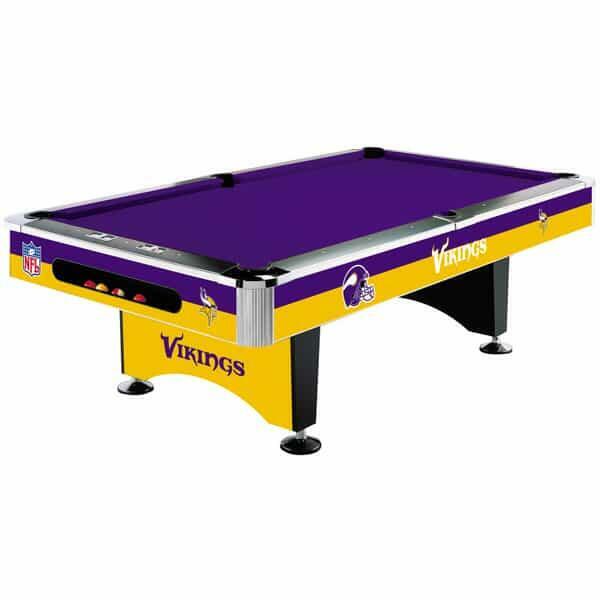 And being the only officially-licensed NFL pool table, it's next to impossible to find anything bigger or better (outside of Ragnar) that represents the Vikings!